NEW YORK and LONDON, September 12, 2018 – Akari Therapeutics, Plc (NASDAQ:AKTX), a biopharmaceutical company focused on the development and commercialization of innovative therapeutics to treat orphan autoimmune and inflammatory diseases, today announced results that demonstrate the potential advantages of Coversin’s unique bifunctional mode-of-action inhibiting both the complement and leukotriene pathways. Coversin has a unique bifunctional mode-of-action that appears to independently inhibit C5 and LTB4 by binding tightly both molecules. In an RA mouse model, performed in the laboratory of Prof. Andrew D. Luster, M.D., Ph.D., Harvard Medical School, the effectiveness of Coversin (PASylated), which binds to C5 and LTB4, is compared to PAS LTB4-Coversin, which binds to LTB4 alone and to Zileuton, an FDA-approved leukotriene inhibitor. The PASylated version of Coversin, which is designed to allow weekly subcutaneous dosing, was chosen in order to help validate this as a treatment option. 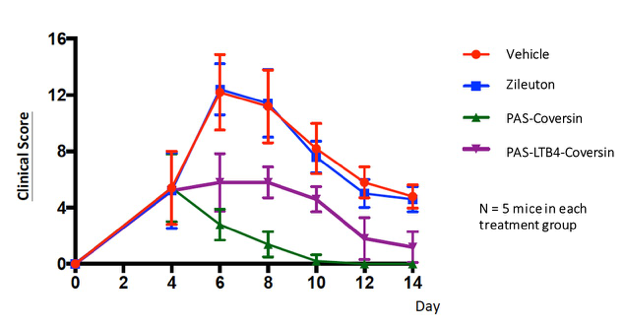 The graph below shows therapeutic use of the two distinct PASylated forms of Coversin and Zileuton administered from day four of the experiment onwards, once arthritic symptoms had appeared. PAS-Coversin, inhibiting both C5 and LTB4, appeared more effective than Zileuton and PAS LTB4-Coversin, reversing symptoms by day 10 in this acute model.